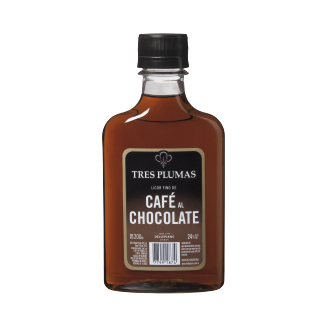 Created in 1962, Tres Plumas coffee with cognac has become the utmost praised benchmark within the local market of beverages. It is manufactured from extra neutral alcohols, imported fine roasted coffee beans and cognac. Later settlement period permits the perfect linkage of all components. When approached to the nose, this deep dark brown-colored coffee looks intense and, in mouthfeel terms, it shows absolute and sweet, with a significant body and chocolate flavor. In 2014, this product was awarded the best in its type by “Bar and Drinks” specialized magazine. How Supplied: In 750 mL bottles and 200 mL hip flasks. Coffee & Whisky: a classic combination that Tres Plumas translated into an elegant and well-balanced liquor. Using a coffee liquor-based component, a portion of imported whisky is subsequently added to create this fine liquor enjoyed either alone or together with an espresso. Plumas coffee-based liquors. A superior fashionable spirit worldwide which, when combined with coffee, results in a persuasive flavor. 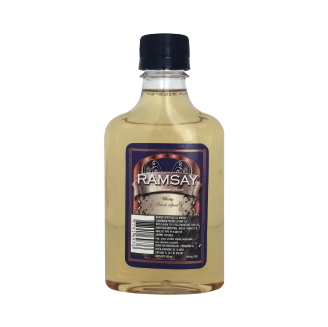 You may enjoy this product on the rocks or with drinks because it is extremely versatile. Classic drink of bartending golden age - the forties. Our Master Distiller gradually manufactures this product as from peppermint´s natural essence as obtained through vacuum distillation and at low temperature of mint leaves coming from India. This is a dark green-colored English type product supplying a sweet and intense flavor, with all the power of the mint. It has the density of a extremely sweet creamy liquor. 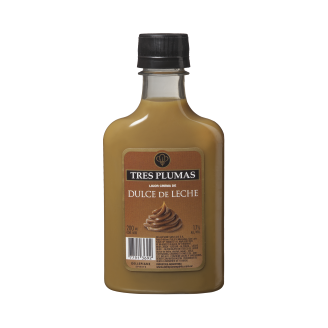 Classic historically traditional Argentine flavors, Dulce de Leche (milk jam) is featured in a delightful liquor by Tres Plumas, thus largely maintaining the loyalty toward the taste and texture of the best exponents. Local demanding tasters specialized in alcoholic beverages have considered this product as the best one throughout Argentina. This historic liquor derives from the natural distillation of anise seeds together with pure water and extra neutral alcohol. Its scents and tastes are deep and intense. Since several years, this product has its own loyal fans enjoying it with a cup of coffee. How Supplied: In 200 mL hip flasks. This product is manufactured as from macerating honey dew-type cantaloupe in extra neutral alcohols. Under this circumstance, our liquor distiller obtains the scents and flavors of the fruit through the most natural method. This is a greenish yellow-colored product follows cantaloupe´s peel. Thus, it becomes a sweet and well-balanced liquor being loyal to natural fruit´s flavor and featuring a unique style and a remarkable personality. According to specialized journalists´ opinion, this Tres Plumas flavor displays the best fidelity to natural fruit. As a local pioneer, this drink features a fine balance between coconut and pineapple scents together with a dairy-based component recalling classic Puerto Rican cocktail. How Supplied: In 750 mL, 1750 mL and 200 mL bottles. This product has been manufactured with Scottish malt and shows a good quality / price ratio. How Supplied: In 200 mL bottles. Tequila is national Mexican drink with original name, as produced from distilling juice which is obtained following the boiling of blue-colored agave plant pineapples. DELLEPIANE SPIRITS imports Tequila directly from Mexico on in-bulk basis. Later on, here in Argentina, our company both hydrates and bottles the product, thus becoming the best alternative, in price terms, to original 100% agave-based Tequila. A grappa born in the Argentine Province of Mendoza during the 30´s which became the favorite one of Argentinean people. It is manufactured as from Mendoza original grape marcs. Unquestionable leader in this market category. How Supplied: In 1000 mL bottles and 200 mL hip flasks. The manufacturing license of this vodka belongs to Burnett´s original trademark in U.S.A. owned by Heaven Hill Destilleries, Inc. 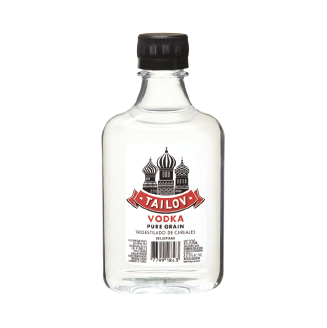 This vodka undergoes a four-fold distillation plus a triple filtering through activated coal to achieve finest softness. 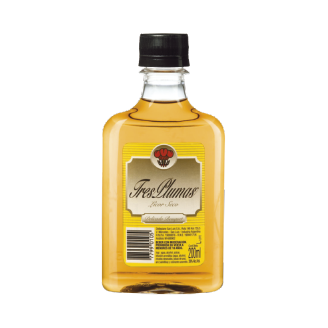 Being a leading product within beverage market, this dry liquor is manufactured with finest distilled aromatic herbs. Later on, it settles and ripens in oak casks during several months. Since many decades, throughout Argentine country, consumers enjoy this liquor together with coffee and directly on the rocks. How Supplied: In 930 mL bottles and 200 mL hip flasks. Recently and integrally launched, with a new bottle and logo, this vodka is manufactured as from extra neutral alcohols through cereal tridistillation thus respecting both methodology and inheritance coming from Russia, the cradle of the best and cherished vodkas worldwide. Our Supported by distinguished Argentinean tasters, our highly qualified Master Distiller creates export quality purest vodka. How Supplied: In 1000 mL, 1750 mL and 200 mL bottles.